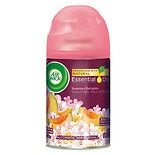 Air Wick Freshmatic Ultimate ...6.17 oz. 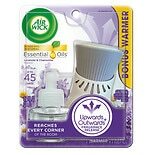 Air Wick Oil Warmer With Refi....67 oz. Enjoy the relaxing aroma of lavender essence mingled with gentle chamomile and precious woods with the Air Wick Freshmatic Ultra Refill in Lavender & Chamomile. This fragrance refill works with Air Wick Freshmatic Ultra units, which will automatically release bursts of fragrance throughout the day so your home will always smell fresh and inviting for family and guests. Each refill lasts up to 60 days and can be replaced with any Air Wick Freshmatic Ultra refill. 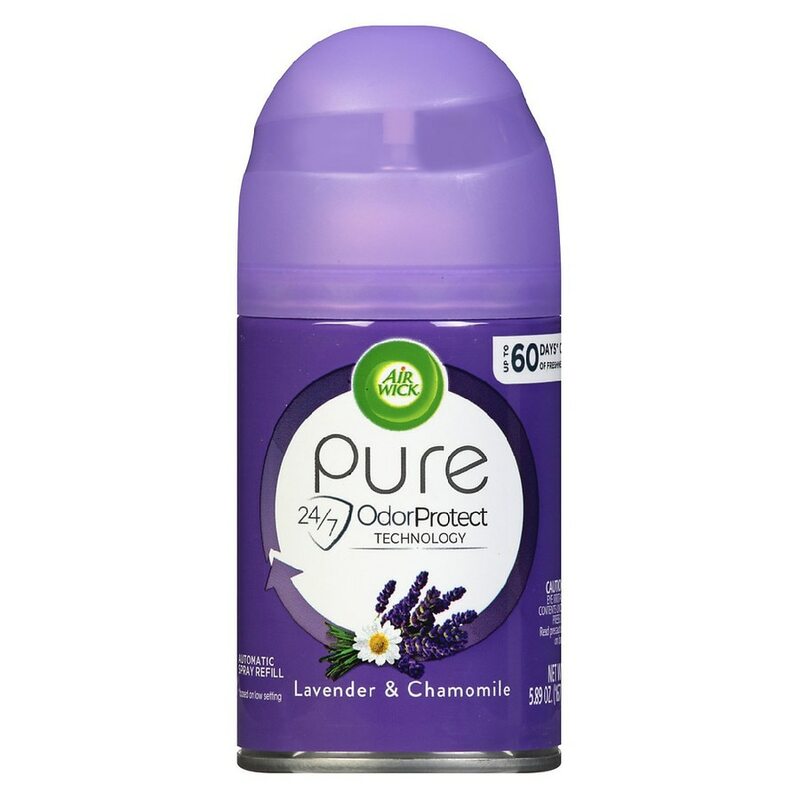 The Lavender & Chamomile Freshmatic refill can be used with any of Air Wick's Freshmatic Ultra units. These include the Freshmatic Ultra, Freshmatic Ultra I-Motion, and Freshmatic Ultra Odor Detect. When your Freshmatic unit runs out of spray, you can simply replace it with any one of Air Wick's Freshmatic Ultra refills. 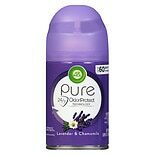 Simply remove the old fragrance can and insert the new one into the unit with the nozzle facing outward until you hear a click. To remove fragrance, unplug unit and firmly pull the can down. 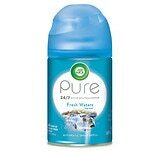 To replace can with this refill, first turn your Airwick® Freshmatic® Unit to Off position. Discard the empty can and make sure the red lever is pushed up. Insert this refill with the nozzle facing outward per the picture on the right. Turn the switch to your preferred time setting of 9, 18 or 36 minutes. The spray will come after a 15 second delay. Keep unit directed away from your face at all times. Danger; Flammable, Harmful or Fatal if Swallowed. Eye Irritant. May be harmful if directly inhaled. May cause allergic reaction in some individuals. Do not spray towards face or body. Do not get into eyes. Avoid contact with skin. Container may explode if heated. Do not puncture or incinerate container. Do not expose to heat or store at temperatures above 120° F. Do not position near heat or electrical sources. Do Not spray directly onto surfaces. Do Not spray into open flames. In case of contact with surfaces, wipe immediately with damp cloth. Do Not use in infant or children rooms. Use in well ventilated rooms away from sleeping areas. For adult use only. Product is not a toy. Contains propellants, petroleum solvent and fragrance. First Aid: If swallowed, Do Not induce vomiting. Immediately call a physician or Poison Control Center immediately. If in eyes: Hold eye open and rinse slowly and gently with water for 15-20 minutes. Remove contact lenses, if present, after the first 5 minutes, then continue rinsing eye. Call a poison control center or doctor for treatment advice. Note to Parents: Use only as directed. Intentional misuse by deliberately concentrating and inhaling the contents can be harmful or fatal. Help stop inhalant abuse.